Let’s set up the Math Center! Little learners need many opportunities to explore, manipulate, represent, and learn various math concepts and skills. The Math center is the perfect place for that when you intentionally plan and set up a Math center, rich in materials that promote Mathematical exploration. Remember research tells us that students need concrete hands on activities, and the opportunity to manipulate materials to develop math skills and concepts. 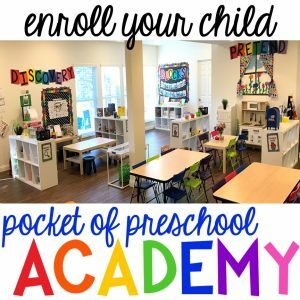 Let’s make your Math center fun, engaging, and hands on for your little learners. This post contains affiliate links. Freebie Alert! Be sure to read to the end because I have a few FREE path games you can download for your Math center! Just so you know, in my classroom I combine my Math and Science centers together aka the Discovery Center. I believe math and science overlap in SO many areas. It’s easy to combine them together in one big center. You can read about the Science Center HERE. Let’s talk organization first. Label your shelves and tubs. You can use clip art or use photographs for your labels. Always pair the picture with the word on the label. I put a label on the outside of the tub and put a label on the shelf. Labels help students (and teachers) know where things go. Students can get the items they need and clean up independently (that’s the goal at least). Grab the classroom labels (with real photographs) HERE. There are some math materials that every classroom should have. Now I am not saying that all of these items should be on your shelf at the same time. Plan and rotate the items in your center based on student needs and learning theme. 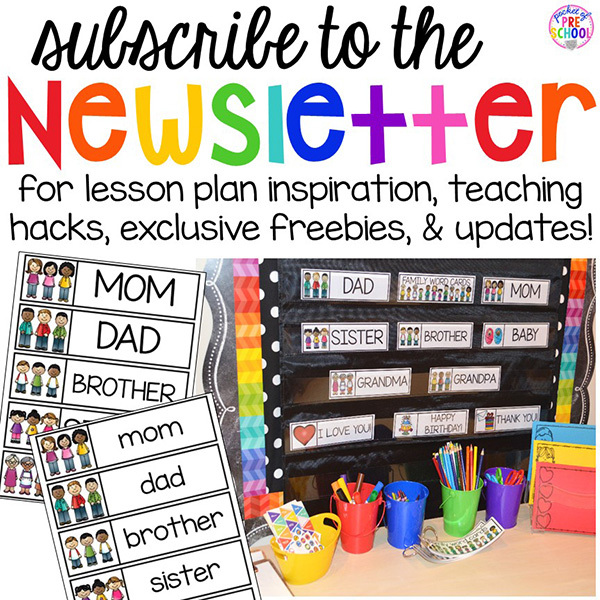 Every week I plan and put out one or two new items in each center in my classroom. Every time I put out something new, something else gets taken out of the center. Some Math manipulatives that every classroom should have are linking cubes, counters, linking chains, pattern blocks, dominoes, geoboards, bingo chips, number manipulatives, scale, measuring spoons/cups, dice, math playing cards, ten frames, ice cube trays, and fun manipulatives (buttons, etc.). 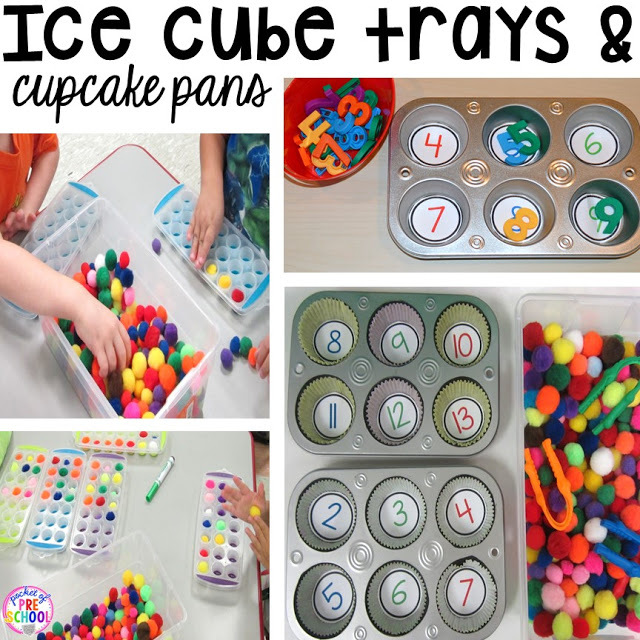 Ice cube trays and cupcake pans are AMAZING for math exploration. Students can sort, count, match, and create patterns in the trays. I love having colorful pom poms (and tweezers to sneak in some fine motor) for students to use with cupcake pans, magnet numbers, and ice cube trays. The cupcake pans and pom poms are from the Dollar Tree. The tweezers are called Gator Tweezers. The cupcake number pan circles are from my Sweets Centers pack. Puzzles are another Math center staple. Foam puzzles, wood puzzles, and floor puzzles are fun to add to your Math center to help your students develop Spatial sense concepts and skills. Add sorting boards or trays to use with fun manipulatives like the buttons above. This board is just a white piece of paper I drew a grid on and laminated. Food serving trays (like veggie trays and fruits trays) are fun to sort in too. You can find a ton of fun colorful trays at the Dollar Tree. 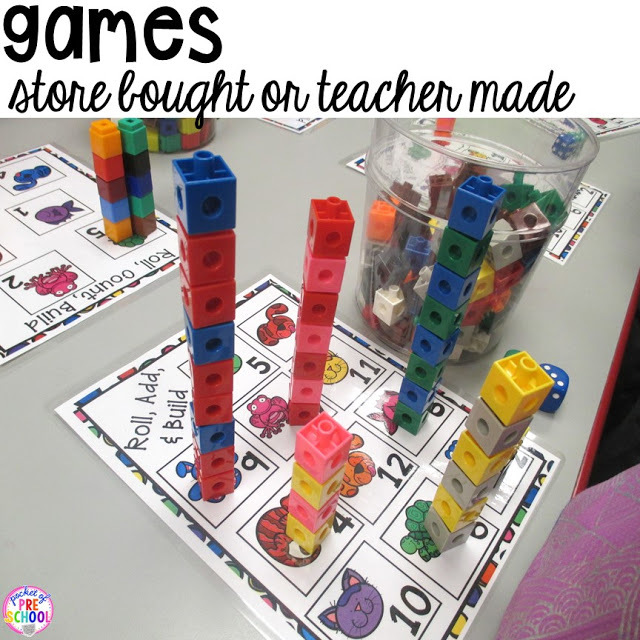 You can never have enough fun Math games for your Math center. You can use a store bought game like Popcorn Count Em’ or you can make your own Math games. I made this Pets Roll, Add, and Build Game when we were doing a pet theme. It’s is my Pets Math and Literacy pack. Let’s talk about Math manipulatives. Manipulatives don’t have to be just counters you find in a Teacher store. This is the manipulative shelf in my office. You can see I have craft supplies, mini erasers, candles, small animals, shells, rocks, cubes, gems, bingo chips, popsicle sticks, pipe cleaners, golf tees, marbles, and a variety of teacher store type counters for various themes. I find most of my manipulatives at the Dollar Tree, Walmart, Target Dollar Spot, or on Amazon. Rotate your math manipulatives based on the theme or season to keep your students interested and engaged during center time. This is the top of my math shelf. It’s the place I usually keep all the themed manipulatives and games I have. I have Valentine’s mini erasers, wood hearts, and heart jewels for students to explore and use to play the Valentine’s Cover Up Game. 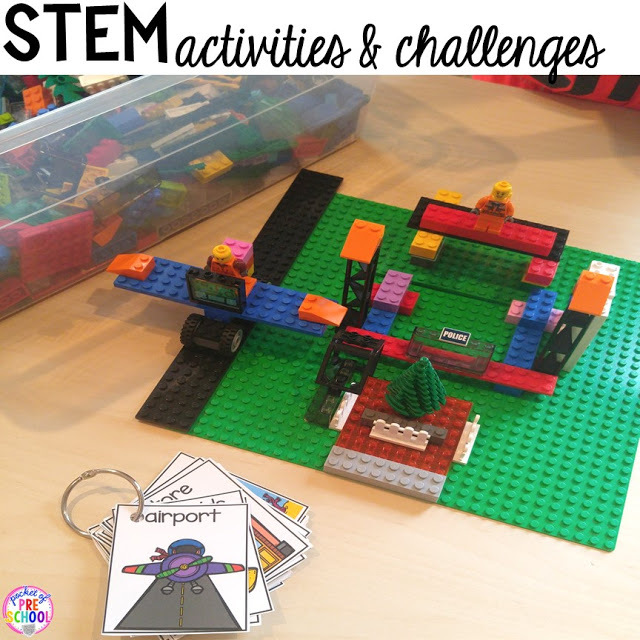 STEM activities and challenges are fabulous to add to your Math center. I always have some kind of block or building item in my Math center. Legos and small wood blocks are my student’s favorite. I added my STEM “I Can Build” cards to the Lego tub to challenge students to build something new. You can grab the cards HERE. Put out a few Math books in your Math center. These are some of my favorite fiction Math books. I just LOVE The Math Start book series by Stuart Murphy. Books introduce students to new vocabulary words and concepts. Try acting out the book or creating a Math game based on the book. When I read Pete the Cat and His Four Groovy Buttons, I bring in a box of fun buttons and tell the students they are from Pete the Cat. They eat it up and are excited to play with the buttons. Don’t forget to read non-fiction Math books too! Set up activities from the book in your Math center. Put the Sensory table in your Math center. The Math learning opportunities you can set up for students are endless! Students can build their vocabulary, count, compare, order, locate, sort, build, create, and measure using various tools in the Sensory table. You can also add a light table to your Math center. When you are planning for your Math center, remember to create learning experiences and activities across all math content areas (number and operations, geometry and spatial sense, measurement, patterns and algebra, and data analysis). Next, I’ll show you some of the fun games and learning experiences I set up for my students to teach various math concepts and skills. The counting concepts and skills I teach using number sense are: one to one correspondence, labeling collections of items, identifying numerals and matching a number with a quantity. Operations and algebraic thinking sounds crazy for little learners to do, but they can do it at a very basic level. You want your students decomposing numbers, doing informal subtraction, doing information addition, and representing addition/subtraction with objects. Exploring patterns is just that….. students copying, extending, and creating patterns. Linking cubes and pattern cards. Geometry for little learners is simply learning all about shapes. 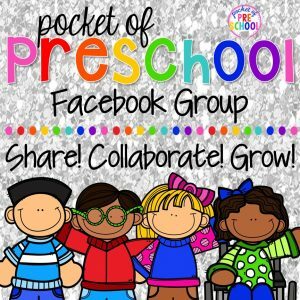 You want your students identifying shapes by name, describing shapes, comparing shapes, creating shapes, finding shapes in the environment, and combining shapes to make new shapes. Measuring for little learners is measuring using standard (rulers, scale, measuring cups) and non-standard tools (linking cubes, chains, beans). Measuring pet animals with rainbow and bean rulers. Read how to make your own rainbow and bean rulers HERE. Exploring data for little learners is collecting data then using/talking about the information. Make your own spinner boards using transparent spinners. That was a long one! Thanks for reading to the end! Grab your FREE path games HERE. Check out all my Math and Literacy Centers in my store HERE. You can find tons of themes, seasons, and holiday center packs. I did all the work for you. Just print, prep, and play! You can purchase them individually or in a money saving bundle. There are THREE bundles: Seasons Center Bundle, Holiday Center Bundle, and Theme Center Bundle (various themes like teeth, pets, zoo, farm, camping, etc.). Is your brain full of ideas? Pin this for later in case you forget! If you need more Math inspiration, check out my Preschool Math board on Pinterest.